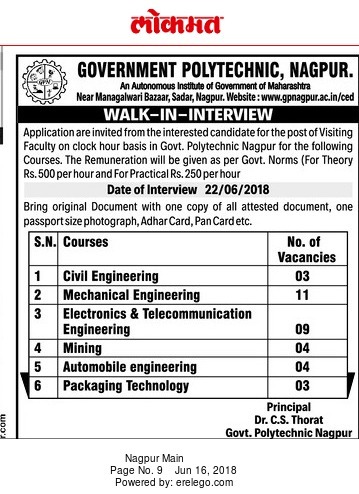 Government Polytechnic, Nagpur has advertised in LOKMAT Newspaper for the recruitment of Visiting Faculty job vacancies. Interested and eligible job aspirants are requested to appear walk in on 22nd June 2018. Check out further more details below. About College: The Government Polytechnic ,Nagpur , was founded on July, 1914 . At its commencement the school had 16 students on roll. The institution has given to Engineering College presently known as V.N.I.T. Nagpur, as well as Govt. Medical College (GMC), Nagpur. The total intake capacity of all programmes is 860 students (first shift 680 and second shift 180 ). the premises of this institute is spread over 22 acres of land with good infra-structure facilities like well equipped laboratories, Computer center, conference hall ,Audio-Visual Room, Community Hall, Gymnasium, Good play ground etc. How to Apply: Interested and Eligible candidates may bring their resume along with all necessary documents and recent passport size photograph to following address on 22nd June 2018.